1. In a heavy bottom sauce pot combine the Passion Fruit Concentrate and heavy cream. 3. In a mixing bowl combine the egg yolks, sugar, and cornstarch. 4. Temper the egg yolk mixture with a little of the boiling heavy cream mixture then thoroughly combine the two mixtures into the heavy bottom sauce pot. 5. Bring back to a boil, whisking continuously and cook for 4 minutes to thicken. 6. Transfer to a mixing bowl, then whisk in the gelatin until completely melted and incorporated. 7. Cover the mixture with plastic wrap and set aside for use at room temperature. 1. In a small sauce pot combine the water and sugar and cook to 220° F.
2. While the syrup is cooking whip the egg whites on medium speed to a soft peak. 3. Slowly incorporate the 220° F syrup into the egg whites at medium to high speed and mix until meringue has cooled. 4. Gently fold the Italian meringue into the Passion Fruit base 1/3rd at a time. 5. Line a sheet pan with parchment paper then place twelve 3 to 4″ ring molds on it. 6. Fill the ring molds 1/2 full with the Passion Fruit Concentrate mixture. 7. Evenly distribute the raspberries among the ring molds. 8. Fill the ring molds with the remaining mixture, level off, and put in a freezer until completely frozen. 1. In a small sauce pot melt the butter until just boiling. 2. 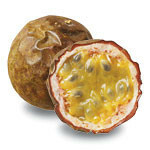 In a blender mix the Passion Fruit Concentrate puree and sugar. 3. Slowly incorporate the hot butter at medium speed and mix until smooth. 4. Hold sauce at room temperature until ready to serve. Unmold the frozen Passion Fruit Gratins onto individual ovenproof serving plates and dust each with powdered sugar. Bake Passion Fruit Gratins for 8 minutes until golden brown. Remove from oven and drizzle with the Passion Fruit sauce around the Passion Fruit Gratins (this will warm the sauce from the heat of the plate). Garnish with fresh raspberries and serve.